Thessaloniki or Salonika or Salonika or Saloniki, is the second largest city in population in Greece took her name from Alexander the Great's sister. Thesaloniki played an important role, before and during the Byzantium history and continues to be one of the most important cities of the Balkans. Thessaloniki is a city with rich history, amazing markets and cosmopolitan night life. The visitor can start his day by drinking a coffee in the famed cafeterias on the beach viewing the deep blue bay of Thermaikos. Furthermore he can visit the very well known market of the city for some shopping, visit the various archaeological places and museums of Thessaloniki. Finally then the sun sets, Thessalonians start getting ready for the night, Thessaloniki is known as the city that never sleeps. One of the most famous archaeological places of Thessaloniki is the White Tower. The symbol of Thessaloniki, the White Tower, was build in the 15th Century as an off shore defensive tower. Initially, it was connecting the East with the South wall of Thessaloniki, which was torn down in 1866. The White Tower was being used as a guardhouse as well as a prison for centuries. Today, it operates as a museum with various selections of icons, wall paintings and other works of art, most of which date back to the Byzantium times. Another well known archaeological place in Thessaloniki, is that of Rotonda. Rotonda is a circular building build in 306 AD as a Pantheon or as a Mausoleum for Galerius. During the reign of Theodosius the Great, with a few changes and a few additions, Rotonda was turned into a Christian church. It's mosaics are unique for the time 4th Century. 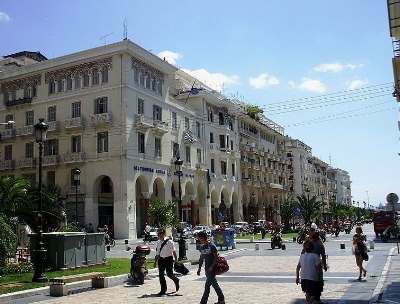 Rotonda is situated in Dimitriou Gounari Street.